testing, you are asked to read letters on distance and near reading charts. The results of visual acuity testing are written as a fraction such as 20/40. compensate for any refractive error (nearsightedness, farsightedness, or astigmatism). Using an instrument called a phoropter, your optometrist places a series of lenses in front of your eyes and measures how they focus light using a hand held lighted instrument called a retinoscope. The doctor may choose to use an automated instrument that automatically evaluates the focusing power of the eye. The power is then refined by patient’s responses to determine the lenses that allow the clearest vision. Tonometry measures eye pressure. 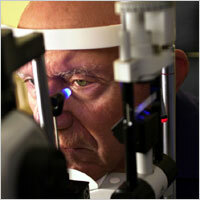 Elivated pressure in the eye signals an increased risk for glaucoma. conjunctiva and surrounding eye tissue using bright light and magnification.